Avoid queuing traffic use the successful ‘Park & Fly‘ helicopter shuttle service. Held every year on the Isle of Wight since 1983, and regarded as one of the UK’s top food festivals, the Garlic Festival is a virtual mecca for garlic fans. 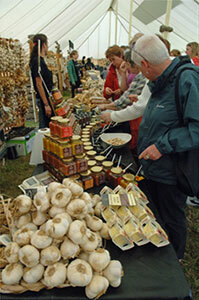 Around 25,000 people attend the festival each year to sample garlic dishes, take part in events and socialise with like-minded festivalgoers. You can watch cookery demonstrations and enjoy a wealth of unique cuisine creations, including garlic beer, garlic ice cream and garlic fudge. The event showcases the great local food suppliers that the Isle of Wight has to offer, with dishes created with the island’s high quality local produce. The garlic is supplied by The Garlic Farm, which has been producing garlic on the island for over 50 years and is the largest specialist garlic grower in the UK. 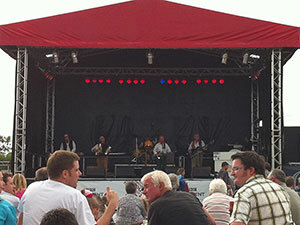 The Garlic Festival promises something for everyone – as well as the eats, there’s also hundreds of arts, crafts and trader stalls, circus and funfair attractions, falconry displays and arena events featuring a host of talented animals, live music from local bands, and a well-stocked beer tent. With a flight from London to the Island taking only 35 minutes you can save time and stress with Atlas Helicopters’ luxury helicopter charter service. Our flexible booking service means we can pick you up from a location near you and fly you straight to the Garlic Festival, so you don’t have to miss a second of the celebrations. For more information you can call our friendly Atlas Helicopters’ Operations Team or get an instant estimate with the form below.